One of the most recognized and priceless extra gear for FeelFree fishing kayaks. The Feelfree Uni-Track accessory mount system is a breakthrough in kayak fishing customization. 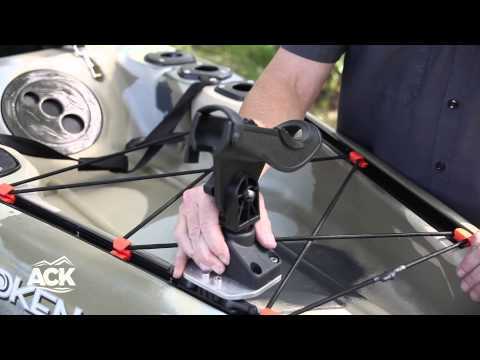 FeelFree Uni-Track allows you to quickly and easily mount kayak fishing accessories to your Feelfree kayak without drilling any holes. Simply attach your accessories to the Uni-Track plate and then insert the Track Runner into the Track Rail and cam the locking levers in place. With the cams released you can slide the plate forward or backward to any position on the track rail. When locked, you'll have a bombproof connection to your gear. The Feelfree Uni-Track is compatible with all Feelfree kayaks that have the integrated Uni-Track system and is compatible with most of the popular accessories on the market. The Feelfree Uni-Track is compatible with all Feelfree kayaks that have the integrated Uni-Track system and is compatible with most of the popular accessories on the market. For Anglers who own FeelFree fishing kayak and want to equip their yaks with additional equipment such as rod holders, fish finders, etc.